well, it certainly has been a long and crazy haul, but the renovation of scruffy dog headquarters is officially complete. at the request of many followers of the scruffy dog facebook page, i thought it was time to post some photos of the space where the scruffies and i spend so much of our time, working on images, meeting with clients, and doing all things scruffy. and for those interested, i’ll share some of the good, the bad, and the downright ridiculous in this epic journey that was meant to be a simple facelift. of course, i’ve included a few ‘before’ photos … and for those inquiring minds, i will attempt to address each photo with product notes! 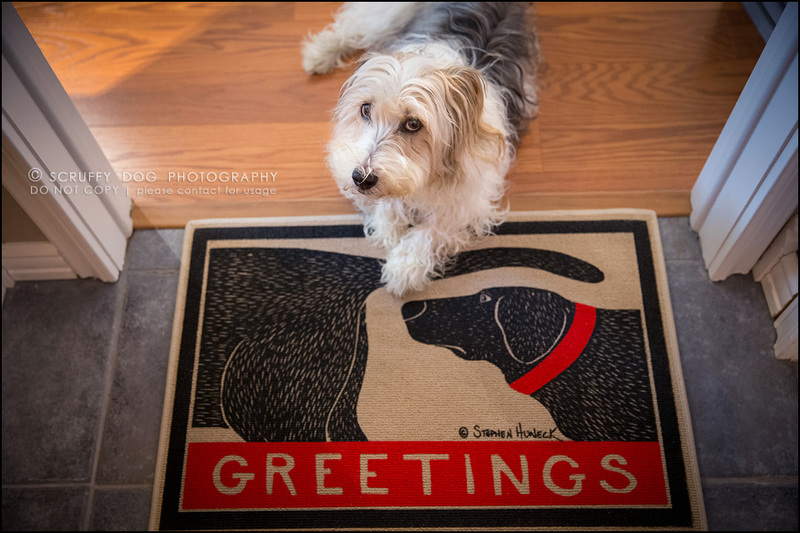 first off, i love our new welcome mat by Stephen Huneck of Dog Mountain. i’m not sure there’s a more appropriate mat available for scruffy dog headquarters. these next few shots are BEFORE shots … this one shows you the lounging space, coffee/beverages area, and the office. and the former client sitting area … or as it was known: the dogs’ workplace bed. my old view from the desk … or in this case, under the desk. … and then the renos began. one of the first things i managed to get done was having the new fabulous studio lights installed. we’ve been all LEDs for a couple of years now, but i LOVE these new LEDs. after hours wasted shopping at lighting stores who quoted thousands of dollars for fixtures and tracks i didn’t even like, i managed to find these little track spotlights at Home Depot, and i couldn’t love them more. the Kelvins in LEDs measure a little differently than regular bulbs or halogens. although these are ‘home’ lights … they are still cooler than incandescent or flourescent, and certainly offer a much cleaner light than halogens, but they are nowhere near too cold. they’re just a little warmer than ‘daylight’ Kelvins, which is more in-keeping with what clients will have in their homes. Kathy Clout of Clout Industries was one of the most amazing individuals i worked with on this project. not only did she and her girl come in and get these lights installed in one day, including my proofing LED strip-lights (shown later), Kathy was always available and generous with her time and advice in trying to find the best solution for my lighting needs. there aren’t enough positive things to say about Kathy! she’s now my go-to gal for anything electrical! of course, i started the process of the renos back in May, bringing on a designer who promised to work as a project manager on this simple reno, since i was still shooting private and commercial clients, editing, and all kinds of other scruffy business. unfortunately, it didn’t work out with the designer … in the end, she cost me more time — waiting for quotes and running around in circles — than it would have taken me to handle this project myself from the start. i definitely needed this project done by the end August, in time for the triple-booked fall season, and by mid-July it was clear that using a designer and counting on their high-priced contractors was simply not going to get me there. of course, this meant that i was working in chaos for a lot longer than initially expected, and while i always welcome the challenge to push the boundaries of my comfort zone, i have to say: running a business when you can’t find things is not something i recommend! i had some files in the garage, others in the storage room … honestly, it would take me ten times longer to complete any standard business task as i searched and searched for the required paperwork. with no project manager/designer, and every aspect of the reno now firmly on my plate, we finally got to work! after the lights, it was time to get some painting done, and even more important, rip out the former white shelves, cabinets and the electric fireplace (hence the former blue wall in the photo below!). while that was being done — in between shoots and clients’ needs — there were several runs to Ikea for funishings, and searching for a resolution for new back cabinets. and even though his schedule was already full with other clients, i was able to bring in my amazingly talented friend, contractor, carpenter and all-around handyman Michael from Burlington to help with not just the custom build on the back cabinets, but also change out several doors, install a couple of small shelves, and help with problem solving when it came to all of the equipment and wires, as well as the tiling in the bathroom, and many other little things. painting wasn’t originally in the plans, mostly because i didn’t think i could handle the disruption, but after realizing that i didn’t have a project manager anyway, and would be in a disarray for a while, i figured, what the heck? huge thanks to Matt of Quality Pro Painting for sweeping in and doing an awesome job … painting around me even as i continued working. and of course, the dogs assisted with supervision and became experts at watching the paint dry. and while everything was being worked on, the garage, as well as the poor back storage room turned into the catchall for a lot of the new office furnishings as well as client artwork waiting to be picked up. for those interested in lighting, you’ll see in the bottom left corner of the images below the strip LED lighting mounted under the white shelf used for print proofing. these LiteLine strips weren’t cheap (more than all the other lighting in the studio), but for proofing client prints and albums, it’s vital to have the right Kelvins. and drum roll … welcome to the new scruffy dog headquarters! this is the client sitting area (just don’t tell the scruffies that!). i’ll get to the custom made coffee table in a moment, but a lot of what you see here is Ikea. i’m in love with our new Basnas wool-and-jute rugs … and from the very beginning i had this Svelvik daybed in mind for this space. most of the throws and the cover are from Ikea as well, and the pillows are from everywhere … a summer of grabbing anything and everything that was grey! my absolute favorite pillow of all, however, has to be this one. the chair, by the way, was a Kijiji find for $65. these custom roll blinds are the bomb. the only thing that would make them even better is if i’d gone ahead with a remote control on them … but come on, seriously, how lazy can i get? a HUGE thank you to Luke of ProMark Window Film & Blinds. Luke and his staff are amazing, and i will never look anywhere else for my window-cover needs! i’m still having a heck of a time finding a plant that is happy down here … being half above-ground we definitely get light, but no direct sun … the trouble is, it’s cool down here. for now, an orchid … but i can already tell she’s not entirely happy here … sadly, i may have to resort to something artificial. the search for a coffeetable is something that swallowed a good chunk of my time … scrolling through all kinds of Kijiji ads and online sources while sitting up in bed. finally, when i could find nothing that completely suited this space or my needs, i worked with Scott from Artefacts in St. Jacobs to build this custom table from an old board i picked out of his stacks. a little whitewash/pickling lookalike and some steel legs which Scott assures me will more than support any table dancing, and this coffee table is the perfect fit … keeping things light and spacious. and of course, this Ranarp floor lamp from Ikea was love at first sight. i also love the desk-lamp of this model, but with my awesome new LED track lighting, i finally have no need for a desk lamp! the client coffee/beverage area is pretty awesome as well. Michael custom cut these shelves for me to work within the alcove and fit the bar fridge … and Scott from Artefacts stained and finished them for me. one of the main reasons for the reno was to create a second work-station for someone who was slotted to join the scruffy dog team this summer … alas, by the time this reno was close to completion, her path had taken her elsewhere. so i’m still possibly looking for someone part-time … and the ‘assistant’s’ work-station sits unoccupied at this point. the saddle stool you see is by Humanscale … both it and my new office chair were purchased from Bakers atWork Office Funiture … their staff is simply amazing, and i have a standing request from them to never forget to leave the Goober at home when i visit. in regards to the leather Humanscale Pony Stool, i only wish i’d been able to try the stool first … while a saddle stool is exactly what i wanted as a second ‘chair’ (as i switch throughout the day), the Humanscale one is very hard, and not narrow enough in the … um … crotch area. i do think this might be a stool i’ll eventually replace. first, let’s look at the client sorting/packaging area. ohmydog, i LOVE my drawers. i’m such a freak for everything being in its place, AND out of sight at the same time. these Alex drawer systems are da bomb! easy to assemble, and just so utterly useful. the glass sorting table is also from Ikea and has been with me for a long time already. i can’t seem to find it on their site. the shelving system, again, is older Ikea, and although the white shelves are new, the wire frame can no longer be purchased … but i’ve loved this shelving system for years. and the dogs’ toy box, of course. probably the main feature and the biggest overhaul in the studio/office was the back cabinets. i wish i had a total ‘before’ photo of what was there, because words can’t describe how dated and ugly those former white built-ins, complete with gaudy scrollwork and electric fireplace, really were. out of everything that was done in this space, ripping out those old cabinets was at the top of my list and could not come soon enough. however, once they were out, it was a long wait to get the custom shelving, drawers and doors put in, as Michael was hard at work with other clients. if i were to document everything that went wrong with this reno — from the time wasted with a designer and her contractors, to business’s ordering in the wrong products in spite of my attention to detail, to the custom desks having to be made three times due to errors and mismeasurements on the manufacturer’s fault — well, i’d have a novel. even Michael, who has conducted more renos than most, couldn’t believe just how many things went wrong with this very simple reno. but the doors got done, and not at the exorbitant price tag i would have had through the designer and her contractor. after spending weeks waiting for a quote on the doors, running all over to look at different reclaimed boards, trying to find someone to build them, and someone else to finish them, then all the hardware … it came down to taking matters into my own hands in order to get things done. barn door hardware can run you a small fortune, but i found this rail system at Home Hardware for a fraction of the cost. and the handle … just a little bit of plumbing i had Michael put together. instead of what could have ended up costing $4000 for three “barn doors”, i went with a whitewash laminate flooring that i’m super impressed with … not to mention that it will be a lot more dust-free than old, reclaimed wood … as much as i do prefer ‘real’ materials. the interior space of these shelves is beyond ample … and the drawers run on heavy-duty hardware that opens the drawer fully too allow complete access to all contents. the old steel file cabinets were a $20 find on Kijiji, and i couldn’t be happier with them. and here’s another BEFORE … the former desk area … old LEDs which never provided enough lumination … the old shelves … and clutter clutter clutter. and now? everything has a place and can be put away. these custom tables, as i mentioned, were a bit of a comedy … having to be ordered three times before it was finally right. these are Arborite, and are a lot bigger than they look here, housing the 27″ Eizo monitor, 24″ Lacie, and the studio television. the main desk is 70″ wide and 36″ deep, while the side table is 26″ by 6 feet. lots of wall space for sample displays, including this 28×52″ framed canvas of the Goober. … and this is just the other scruffy that keeps me company while i work. and as i mentioned, i love these Alex drawers from Ikea … they make me smile every day … the white ones in the sorting/packaging area … and the two sets of gorgeous dark grey ones under my desk. the one grey set you see below was retrofitted by Michael with a slide out platform instead of a top drawer, and this is where my laptop sits in its docking station and feeds the Lacie display. and here it is today! to be honest, i have trouble getting clients out of the washroom sometimes, as they become so engaged with the row of two dozen 5x7s! … even though it is not without its morning traffic jams. i hope you enjoyed this peek (well, much more than a peek) into the place where it all happens, where i spend at least 12 hours a day, every day of the week, working at what i am passionate about. …certainly more passionate about than renos! jen - Ummmm wow?!?!?! It looks amazing!!!! My favorite is your table, I LOVE IT. I have a bench that is very similar and would kill for a table that is the same. The process had to be a nightmare, but wow what a great outcome. Carol Watson Lyons - LOVE LOVE LOVE!! Thanks for sharing! Tina Armstrong - Absolutely beautiful !! Annette McDonald - Awesome! Great ideas to inspire me. Patricia M Cooper - Absobloodylutely stunning, Illona. And I notice you still have a passion for river rock! But where’s the notice “Piddlers will be persecuted?” !! Caitlin McColl - Oh my goodness Illona, CONGRATULATIONS! It looks absolutely incredible, you must be so happy!!! Holly Garner-Jackson - Wow! 4 paws up!!! This is a stunning vision you had and now live in. You never cease to amaze me my friend! Well done. I love the towel hook! Teresa Berg - OUTSTANDING! beautifully designed and beautifully executed. I know you will enjoy it! Nancy - Wow! It’s beautiful and so well organized… Thanks for the tour! Wanda Oldfield - gorgeous ! Judy Gadsby Belleville - Beautiful work just like everything you do…creative and easy to come home to I’m sure. Ursula Burkhardt - Absolutely stunning! Michelle Bradshaw - Now that it’s done, it’s stunning Illona! The only thing I miss are the visits to Ikea. Are you sure you couldn’t use that desk lamp? Jackie P - LOVE it! So clean and modern but still feels like home. Thanks for sharing! Laura Hennige - Illona, job well done. I am such an admirer of your images. You have such great vision. Best to you in 2015. Rachel Potter - I thought it looked fabulous before… now I am just blown away!!! Darlene Dranfield - Illona, this is wonderful. Well done. I know what it is like to work with a designer. Sometimes it turns out really well, but you still need to put in a whole lot of your own time, so might as well do it yourself, and what a great job you have done. Jennifer - How refreshing and wonderful! Beautiful job!